You should submit this to YUP. How would I do that? I read the mod page and I don't quite understand other than "Just make sure to tag your fixes as at least "can reuse with credit" in the permissions section. ", which it is. you probably don't want your fixes in Yup, cause YUP has a bunch of bugs itself. Try to go into a barrack in the Crimson Caravan camp and you won't get out again. I fixed a few of those a while ago, but keep running into more errors,a and also in YUP, there is so much that cannot be classified as a fix, but more user preference that i dropped it completely and only merge fixes in my gamefixes mod that actually fix something. It also edits thousands of stuff that was either too high or low in the terrain, editing landscape in FalloutNV wasteland results in floating trees, so fixing stuff also messes up other stuff. In my +2000 hrs. of FNV gameplay I was never bothered by this because I never play in 3rd person mode a game meant to be played in 1st person mode. 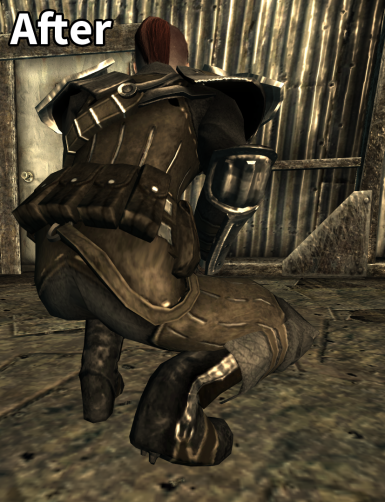 If I noticed it though, I took it like ammo pouches were stretching on the lady's buttocks. With Love and Hate (or any knuckles) equipped there is a strange texture glitch on a lady's right hand. With Love and Hate (or any knuckles) equipped you'll see a right hand gap on a gentleman's right hand (Leather Armor, Lightweight Leather Armor or Reinforced Leather Armor also equipped). Partially solved by AusAllerWelt for Leather Armors only (not Reinforced versions). Very evident and very annoying for a melee/unarmed character. 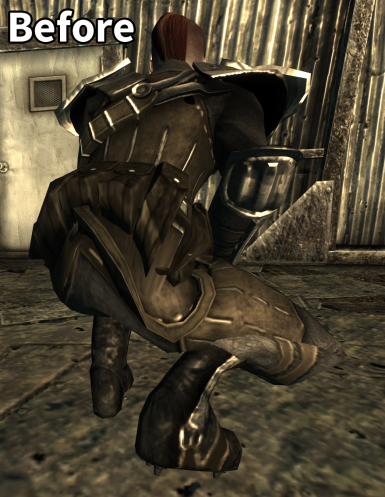 https://www.nexusmods.com/newvegas/images/111460 -> the right hand gap. uou, never see that before. That´s bad.